San Antonio would not normally be high on my vacation list. I visited recently for work, but luckily, they plunked us right in the heart of the tourist district, because the convention center happens to be built right over the river that makes the city's famed Riverwalk possible. 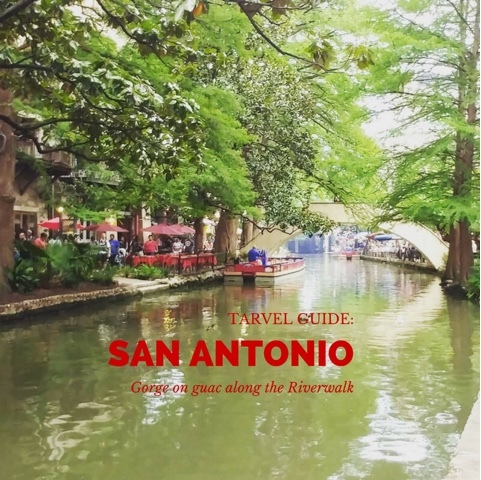 It turns out that San Antonio is actually one of the fastest growing cities in the country, and I don't know if that's because the economy is booming while the cost of living is low, or because everybody's obsessed with guacamole, but that growth means many good things for visitors - be they for business or pleasure. So I visited The Alamo, and yes, I remembered it, too. 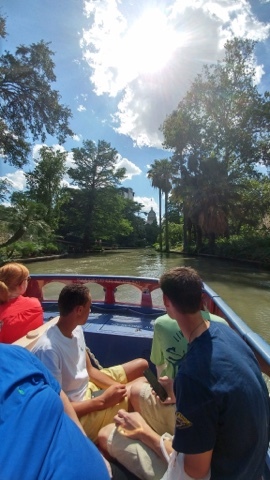 I even did the Riverwalk boat cruise, which takes you the length of this attraction, lined with restaurants, museums, hotels, and more. I did laugh when the guide told us all about how busy the Shops at Rivercenter Mall is, however; I'm a seasoned shopper, and that mall held very few stores of interest for any real retail therapy. Because my hotel, the Marriott Riverwalk, was right on the body of water for it's named, I spent much of my free time along this picturesque canal. BTW, the hotel is pretty great, if you're looking for a place to stay. 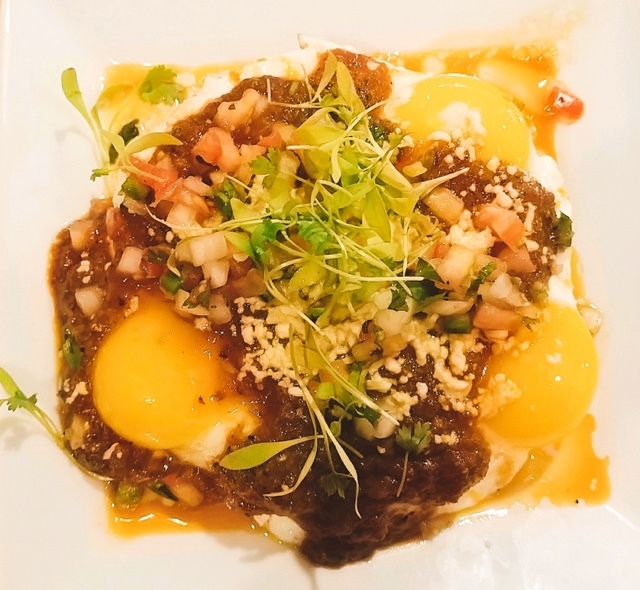 The HVAC in my room was a little loud, but the bathroom was clean and modern, the bed was good, and I must say, the heuvos rancheros I had two mornings in a row in the dining room downstairs were very impressive for a hotel restaurant. The first night in town, my colleague Jess and I visited Casa Rio, the oldest Mexican restaurant along the Riverwalk. It was muggy outside, so even though there's boucoup patio seating, we took shelter within the cool, thick adobo walls for a very authentic Tex-Mex feast. We were charmed by the mariachi band and the flavorful, mildly spicy queso alike. The fresh tortilla chips were thin and delightfully crispy, and the guacamole was simple but perfectly fresh - no premade dips here. 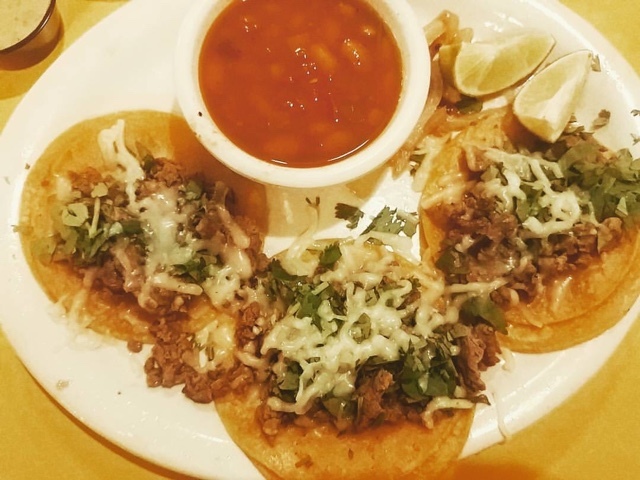 I ordered the Commerce Street Tacos, which were tiny, doubled up corn tortillas filled with piquant, well-seasoned beef picadillo. They were topped with melty, mild cheese and served with pinto beans in a light tomatoey sauce and fluffy rice. This was simple food in a clearly historic setting, and I give it a seven on the BHS scale. Night two, we hit up the Iron Cactus, a little more high end on the Riverwalk Mexican eats scale. Iron Cactus is - GASP - a chain in Texas, something I'm usually against, but I'd eaten at the Austin location, and knew it was good. This time, we enjoyed a seat on the patio and enjoyed the somewhat less humid evening. Our sweet and fun waitress Susie mixed us up one of the more unique tableside guacamoles I've ever had for our appetizer. It had not only lime juice, but also fresh squeezed orange juice in it, plus garlic powder instead of the bite of fresh minced garlic. We absolutely loved it, along with the complimentary hot, roasted chile salsa, and sweeter, cold, fresh salsa and chips. 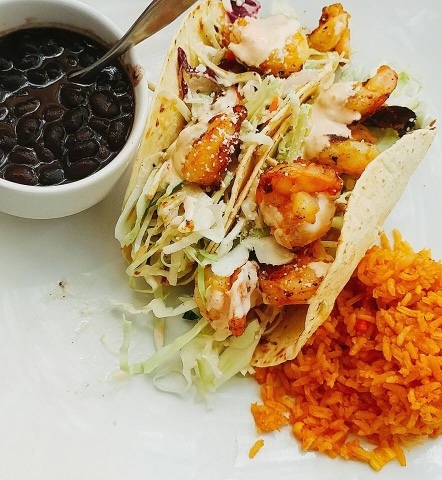 I ordered the shrimp tacos for dinner, and was pretty damn happy with the sweet, succulent shrimp that weren't overcooked by even a hair, but were savory and topped with crunchy cabbage slaw, bright cilantro, and sharp and creamy lime crema. The black beans were very well seasoned, and if I hadn't eaten so much guac, I may have even eaten a respectable amount of them. As ever, I was underwhelmed by the Mexican rice - I'm always looking for this staple side to be more flavorful, and this, like most, was pretty plain. Honestly, though, I had enough great food to keep my stomach busy with no rice at all. It was a throw-away. I don't typically score chains, but Iron Cactus is a seven in my book. The next day, I met my buddy Laura at Rosario's, a San Antonio institution recommended by some of my Skimm'bassador sisters online. 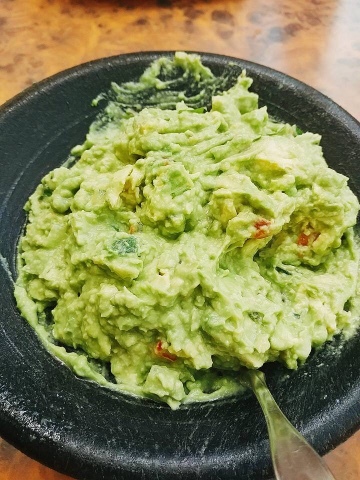 Rosario's is not on the Riverwalk, but it IS absolutely crawling with locals, which is just one of the attributes recommending it for your visit. Another? 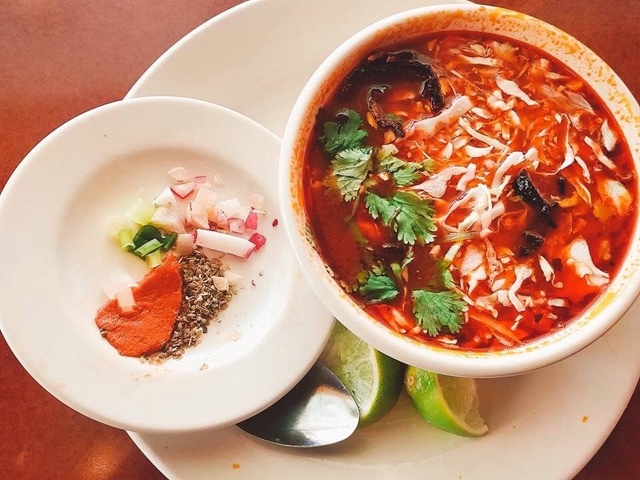 This totally baller posole soup, which is a chile-laced, lip smacking bowl of pork, hominy, and gentle heat that you enrich yourself with a small plate of fixings like fresh chiles, lime wedges, and diced radishes. 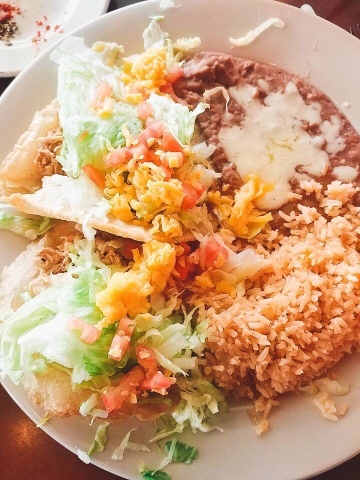 It was rich, bright, full flavored and absolutely a taste of Mexico you don't find at your run-of-the-mill Tex-Mex spot. Because I never know when enough is enough, I also demolished the pulled chicken puffy tacos, which are nestled in fresh flour tortillas that are deep fried so they puff up into crispy pillows for a mound of savory, juicy shredded chicken meat bathed in a tomato and chile sauce, with shredded cheese and a shower of lettuce. Refried beans, served on the side, were 100% made with lard and you know what? Praise the pig for that, because they were creamy and earthy and just slightly sweet - the ideal of what beans aspire to be. Roasario's earns a solid eight on my BHS scale. OK, one last night in town, and one last recommendation for your San Antonio trip. Back on the Riverwalk, I dined alone at Boudro's Texas Bistro, one of the premier restaurants along the river. This elegant gem has an old world, French country feel on this inside, but I braved the intense early evening heat and was spoiled on the patio by my congenial waiter, who never let my icy glass of water (or the one of Grey Goose and soda, for that matter) slip towards empty. I enjoyed the massive cauldron on shrimp and grits I ordered immensely. 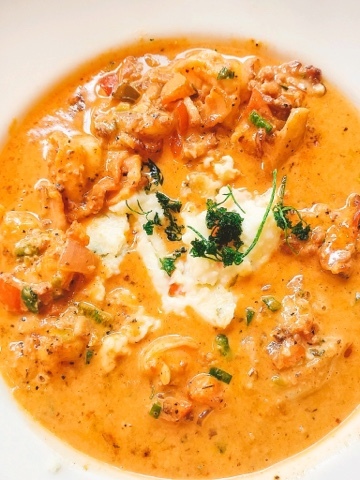 Not only were there chunks of smoky bacon in the stunning, savory sauce studded with poblano chiles and scallions, but the shrimp were plump and sweet, and the grits were stone ground and rustic. This was a gorgeous, lovingly crafted dish, and you should get it into your mouth as soon as possible. For dessert, I shoveled in the toasted nut brittle ice cream with hot fudge. The fudge sauce wasn't too thick nor was there too much of it, so the praline-like brittle was really the star of this dish. 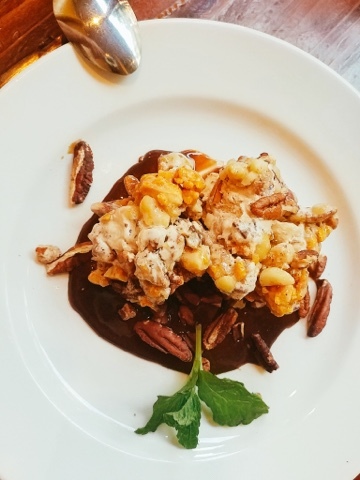 Huge, whole cashews, hazelnuts, and pecans were coated in crunchy candy and made for a textural delight with the sweet ice cream. This was a masterful dish. I would give Boudro's a nine on the BHS scale. San Antonio's Riverwalk is a much more charming experience than I expected. There are waterfalls and nooks all along the route that take you by surprise and bely the hoards of tourists while beckoning you to enjoy yourself and slow down. In addition to all these terrific restaurants, I enjoyed shopping at the Shops at La Villita, a small shopping village located just up the river a bit from Casa Rio. These former Spanish soldiers' huts now house galleries, handmade jewelry studios and really fun little clothing and art shops. I highly recommend this local shopping over what you'll find at the River Center. I hope you find as much to savor in San Antonio as I did! My personality is big; my hunger is bigger!